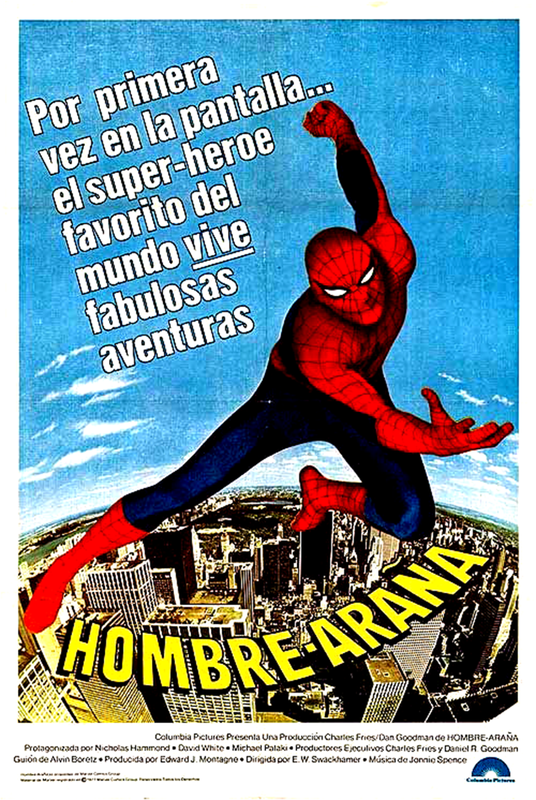 For those who have never seen the original 1978-79 Spider-Man TV show (and that’s most of you, since it has never been released on Blu-ray, DVD or streaming), it was commissioned as a TV movie that would serve as a “backdoor pilot” to an ongoing series. The movie, which debuted in September 1977, was a ratings success, and after some post-pilot tinkering (cast changes, mostly) the series launched in April 1978. For some reason, instead of giving it a regular time slot, though, CBS used it as a heat-seeking missile, airing episodes in clumps to run against other networks’ hit shows, hopefully draining some of their audience away. In an age where you had to actually sit in front of your TV and watch a program lest you miss it forever, this was an insane, maddening strategy, and it couldn’t have done Spider-Man any favors. Anyway, Spider-Man tells the story you’re all familiar with, but with some major changes: Peter Parker (Nicholas Hammond) works as a photographer for the Daily Bugle, where he is on the receiving end of blustery abuse from publisher J. Jonah Jameson (David White). He is also a grad student, and one day while working on some experiments involving radiation, he sees an unwanted visitor. Peter gets bit, you know the rest. Except here, there is no Uncle Ben, so our hero’s decision to become Spider-Man is mostly done on a whim. Not too long after the spider bite, he notices he can climb walls, crawling all over the outside of the townhouse he shares with his Aunt May (Jeff–yes, Jeff–Donnell). After stopping a mugging by scaring the bejeezus out of the crook by scampering up an alleyway wall, he attracts the attention of random passersby — and then the Daily Bugle. Jameson wants pictures of this “Spider-Man” of course, so Peter goes home and makes himself a snazzy suit. For the most part, Hammond is fine in the part, if bland. He’s not given a lot of character stuff to work with, so the blame can’t really fall too heavily on him. My favorite moment of the whole show comes during this “trying the costume on” scene when, after seeing himself in the mirror, he becomes giddy with the sheer weirdness of the path he’s setting himself on. The other plot going on involves a bad guy named Byron who in public is a famous self-help guru, but is actually a crook using his abilities to compel his patients — some of them prominent doctors and lawyers — to commit crimes! Eventually, Byron decides to extort all of New York City, threatening to have a number of its citizens kill themselves unless a huge ransom is paid. As Spider-Man, Peter meets up with some of Bryon’s goons, including three samurai types(! ), and the effects are… well, OK, they’re pretty dodgy. 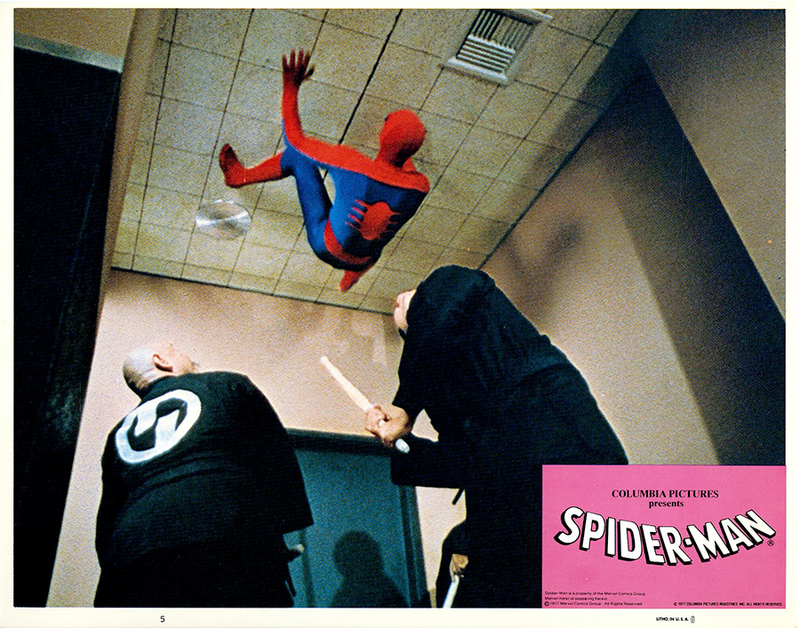 There’s some really bad matte shots where Spider-Man isn’t even touching anything (thanks to mismatched footage), and lots of the guy in the suit (often the stuntman, not Hammond) walking on what’s clearly the floor with the camera turned on its side, ala the Batman TV show. 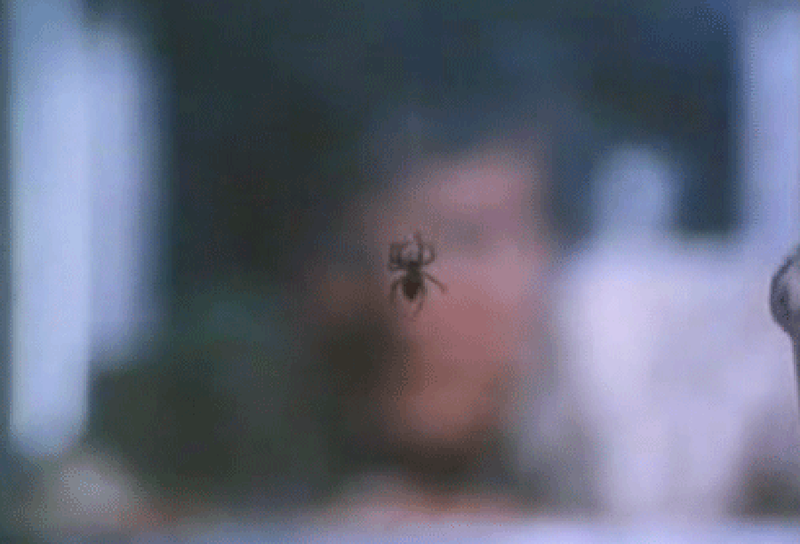 Once in a while, though, they pull off something cool, like when Spidey kicks a bad guy from his position on the wall — hardly anything anyone would even notice today, but in 1977 this was still pretty sophisticated for TV. Later, Peter visits Byron and gets slapped with one of his mind-control bugs. In a great scene — the most tense of the show — Peter walks like a zombie to the top of the Empire State Building, preparing to kill himself by jumping. This scene is shot in an almost hand-held, POV-style, and it’s quite effective. Peter here reminds me of some sort of mass murderer who looks totally calm, but is about to go off in some horrific way. Luckily for us, and himself, Peter accidentally crushes Byron’s pin on the pointed guard railing, waking him up just in time. 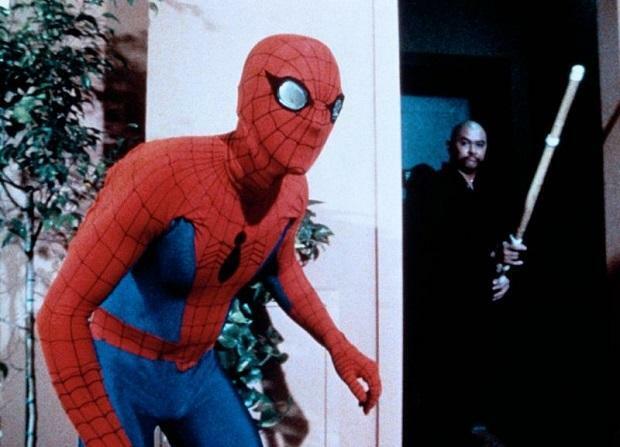 He dons the Spidey costume, pulls down Byron’s equipment that is sending the nefarious signals, which causes the villain’s computer to blow up, turning Byron into a partially immobile zombie. Spider-Man cheerfully suggests Byron turn himself into the police, which he does. And with that, Spider-Man is ready for another adventure! The main flaw that Spider-Man suffers from — and it’s the same flaw we saw in 1978’s Dr. Strange (click here), and even in 1997’s unaired Justice League of America — it’s that there’s not enough of the stuff you came for: namely, superheroics! The Spider-Man TV movie gives a lot of screen time to Peter, which makes sense since you’re trying to establish the character. But then there’s Michael Pataki as a police captain, and he’s straight out of a thousand other cop shows airing at the time. All the stuff at the Daily Bugle is OK, but after only a minute or two of Spidey action, did there need to be what felt like a dozen scenes there? If I want newspaper drama, I’ll watch Lou Grant! TV networks were still very unsure people would watch a “serious” superhero show, so they tended to lard them up with familiar TV tropes — The Incredible Hulk was just The Fugitive, after all, but the talent behind that show made that work pretty well. With Spider-Man, I half expected to see Starsky & Hutch’s red Grand Torino vrooom by at some point. Still, there is some fun stuff here. There’s a point where an under-the-weather Spidey tries to get a lift via an off-duty cab, but can’t, so he bums a ride inside a garbage truck. If that’s not a scene directly from a Lee/Ditko Spider-Man comic, it sure feels like it. But those moments are few and very far between. Maybe it’s my childhood nostalgia talking — I distinctly remember watching Spider-Man as it aired, and being thrilled that I was just getting to see a live-action Spidey — and I’m just viewing this more warmly than it deserves. But, for all its flaws, I’d say this series definitely deserves a home entertainment release. Poor old Aunt May could use the royalties! Rob Kelly is a writer/artist/comics and film historian. He is the co-host of Aquaman and Firestorm: The Fire and Water Podcast, the host of The Film and Water Podcast, and the host of TreasuryCast. He would love his own Spider-Buggy. For REEL RETRO CINEMA: The 1978 Dr. Strange TV Movie, click here. For REEL RETRO CINEMA: Captain America’s 1944 Serial, click here. I’d tend to agree with pretty much all of that nicely balance review, I was expecting a hatchet job! Having loved it as a kid I have very warm memories of the show, both in the cinema (here in the U.K. that’s where we first saw it) and on friday night TV, perfect for a 6 year old kid. I have a well worn bootleg that I still enjoy immensely (a lot to do with the fantastic 70’s theme music!) and I’d love a more polished copy to view. I’ll just add that some of the stunt work was particularly daredevilishly astounding (especially in that era of Evil Kinevil and the Human fly!) the shot of spidey gliding down the in the background of one shot, done for real, sets my vertigo addled nerves on edge. And the episode where he was clearly in actual N.Y, not the usual L.A. stand in and is running around the edges of skyscraper rooftops and clambering down them, shot from some distance to show the reality of the stunt makes me nervous just to think of it. That and all that mad Kung Fu since it was a product of the 70’s, culminating in a pretty cool trip to Hong Kong, the show was fun when it wasn’t being, like you say, a typical 70’s T.V. drama. Really needs a proper release! This fits in line my recollections too, Rob. Granted, I haven’t seen it since the 70’s, bar a clip or two on Youtube. The costume actually looked pretty good for the times. Compare to those hatchet jobs on the Captain America TV movies. I thought Nicholas Hammond had an earnest appeal, although he never felt like Peter Parker to me. Rob was nicely putting it when he said this was insane and maddening. I can think of a couple of other words. Otherwise, it’s a good article and I hope Rob didn’t just paint himself into a corner by mentioning JLA, I really hope he won’t have to cover that as a toe-in when the JL film comes out. Oh, he will, Robert. He just doesn’t know it yet. I think for the time you couldn’t ask for better for tv w the sized budget that it had. I had fond memories. And, if you look at the marvel cartoons while drawn pretty well. There wasn’t any action going on. They just did the best they could for the time. If you look at the Japanese version on YouTube it’s even cheesier. It looks a lot like spider man meets the power rangers. Which is hilarious. I’m just glad I had something to watch. I was a sick kid in the hospital w pneumonia a lot. I had something to brighten my spirits as a kid.